Nice… I really hope that the three-sixty will be a hit in Japan. You don’t know what an iSCSI Target is? Well simply an iSCSI Target is the “device” that represents a logical disk volume on an iSCSI Server. If you don’t know what iSCSI is – please read here and come back. So let’s take the case that you would like to make a harddisk volume available across the network. The best block oriented protocol that you could use (and the best sounding…BUZZWOOOOOOORD!) is iSCSI. So there are some commercial iSCSI Implementations for Windows and there are some iSCSI Implementations for Linux. Today cosrahn implemented a solution based on the Linux iSCSI Enterprise Target Project. The iSCSI Initiator is the client part of the solution. It can either be software (like the Microsoft iSCSI Initiator) or hardware (like the Adaptec 7211C). In our case it’s a complete software solution. Cosrahn installed a Gentoo Linux with a 2.6.12.5 kernel. That took the most of the setup-time. Then he downloaded the source from the iSCSI Enterprise Target page and compiled and installed it. # Targets definitions start with “Target” and the target name. # is freely selectable. For further details please check the iSCSI spec. # in our case /dev/sda4 is a partition without any filesystem. After that we started the iSCSI Target daemon and configured the Windows Client to use the target. This is the “startup-screen” of the Microsoft iSCSI Initiator. 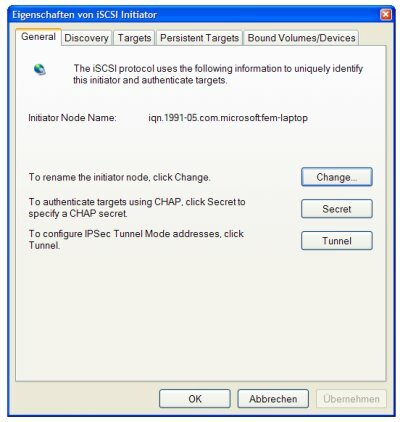 You can see the node name of the iSCSI client. This is the “iSCSI Server Discovery” Tab of the Initiator. 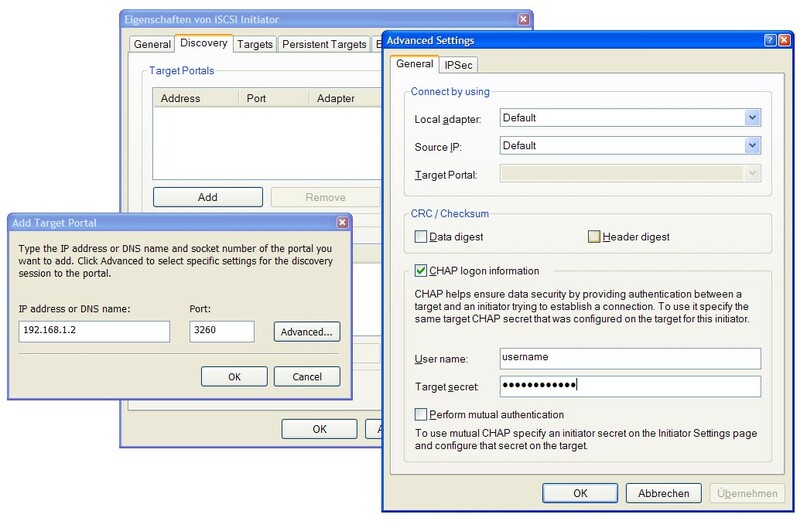 You have the choice to let the iSCSI Initiator reconnect to the Target automatically on boot time and of course you have to authenticate yourself to the target. In this case it’s “username” and “specialtargetpassword”. After you entered everything correctly the “inactive” flag would become a “connected” flag. Now fire up the Disk Management in the Computer Management MMC-SnapIn. Voilá! You should now see a Disk with the size of the exported target…Just start using it like any other hard disk. Create a partition and a filesystem.